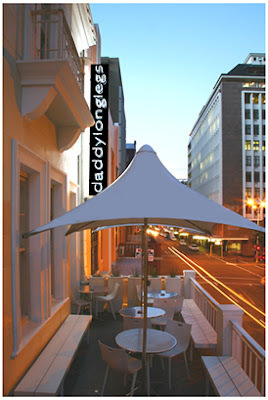 Cape Townâ€™s Daddy Long Legs hotel’s latest addition to its array of rooms kitted out by local artists is a rather nice new courtyard space. 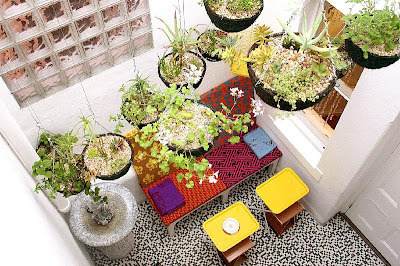 Young designers Liam Mooney and Christie Fels have transformed an inner courtyard into a â€˜Granny conservatoryâ€™, reminiscent of suburban South African stoeps and patios, complete with concrete water feature and hanging garden. 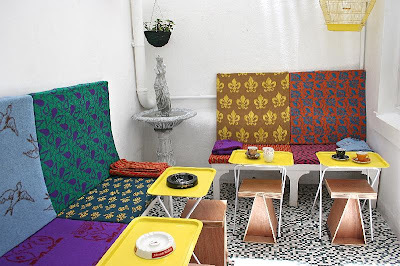 Keep your eyes out for touches from young design stars: Grannyâ€™s cushions and knee blankets are avant-garde knits from clothing designer Richard de Jager, and the stools are made by Xandre Kriel. The Conservatory is open to the public every day of the week for tea, gins and tonic, or whatever other tipple granny might prefer. All images from the What if the World website.